1. Made up of nine LED bulbs.narrow.the lighting angle is 100-120 degree,big. used in various as stop light. 2. Character: super bright LED, the design of anti-heat well, T20 wedge base. 1. Part no: T20-7443-9X-D12 series. 2. Color: red, yellow, blue, green, white, pink. 3. 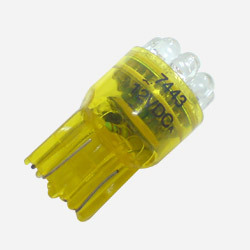 Forward voltage unit: V: 13.2V. 4. Viewing angle unit: deg: 14. 6. Shockproof, durable, long life. 8. Fast active, pure color. 9. IC controls the flash changes to give out various different flashing impact.